Clarets boss Sean Dyche never had any thoughts to take match winner Scott Arfield off against Everton. Arfield was booked for a clumsy challenge on Seamus Coleman in the first half, and spoken to by referee Mike Jones after another foul on the Irishman, and looked to be skating on thin ice. However, Arfield had a hand in Sam Vokes' opener just before half-time, and produced a controlled half volley to net a late winner after Johann Berg Gudmundsson hit the bar. Dyche, asked whether he had pondered replacing the Canada international, said: "No, not really, he's a sensible player. You could have got booked for anything today. "I was stunned, I said to big Duncan Ferguson, 'your career would have been shot mate, finished before it started!' Including my own, of course. "I don't know where it's going with decisions, some are impossible. "We actually had a man head our own man, and they got a free kick. That's a new one on me. I've never witnessed that. It was interesting." 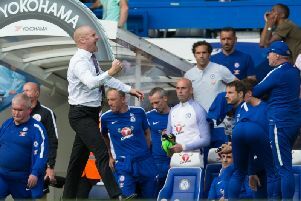 And while Ronald Koeman felt the result was unfair on Everton, after the ill fortune suffered last time out at Turf Moor against Arsenal, Dyche smiled: "I've said a few times unfortunately this season, when things have gone against us, you like to think, over a season, you get a bit of balance, and that was on show. "We had to earn it, because there were some interesting decisions during the game, I felt. "But overall, I like the fact we got back to what we are about, last week at Southampton, we didn't play as we play, we didn't make the game about us. "I was pleased we attempted to make the game about us. We like to play mixed football, to make it awkward for the opposition, we want to work from a good solid framework, which I thought was on show, and I want my team to give everything, which they did. "On top of that, I hope it's recognised, they are two terrific goals. "The football played in the build up to the first - there's a lucky finish to it, but the football is really high quality. "The second goal is a different goal, you've got to affect games in as many different ways you can, and Johann hit a fine strike deserving of a win, but it hits the bar, and what a sublime finish from Scotty Arfield. "All that on top of losing key players as well, so I'm very pleased with the whole squad." "Just on Friday, Boydy was struggling a little bit Thursday, he got a knock in the back last week at Southampton, and just couldn't come through it. "Andre was missing as well, he comes back into contention now, and Barnesey has had a good week, so that's improving, and Steven Defour is better news as well from what we thought. "They're important players for us, so to miss them and still get that performance is very pleasing. "You want players to come in and play with that bit of freedom, and I thought we did it from a good framework. "I thought the organisation was good. "We had moments of breaking from that, putting them on the back foot at times, and we know we have to do more with the ball at times, but we're developing the team, and it is developing. "My job is to look through results sometimes, not at Southampton, where we were way off it, but the Leicester game, we were right in it, until four minutes of madness. It wasn't an overall bad performance. "It's picking those bits out and reminding the players what they need to improve on, but certainly not taking away the will and demand of the group. "Ian Holloway said we have a strong jaw, and that was on show again, the ability to stay in it to win it, and take the points." James Tarkowski and Jon Flanagan also came off the bench to help keep Everton out before Arfield claimed the points, and Dyche was pleased with them: "I thought Lukaku was causing too may problems second half, so I put Tarky on in front of him and he did well, shut that type of pass down. "Ben Mee is a very good player, simple as that, he and Keano have got a very good partnership going. "We looked at possibilities of how we could operate today, and I was pleased with the format we chose. "Scotty Arfield did very well, Kights came in and did well, and Flanno did fantastic - that's a really tough game to come into at that stage, him and Tarky, and then Patrick Bamford worked as hard as he could."